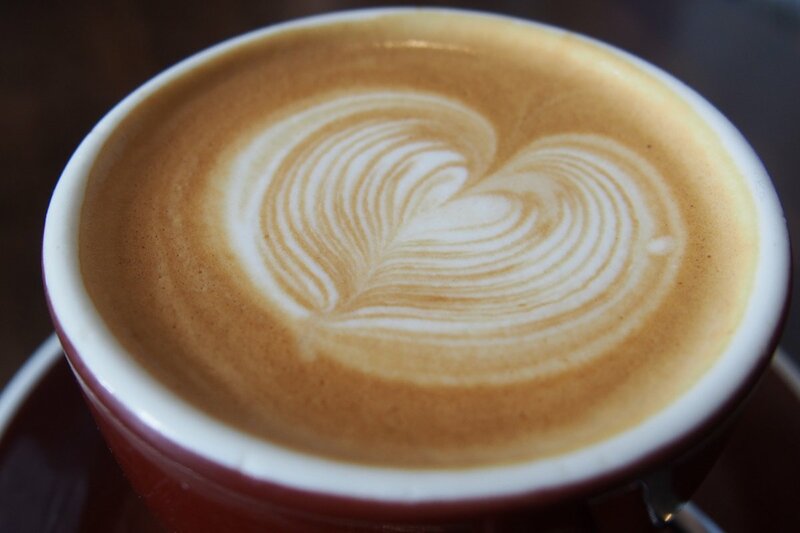 Previously reviewed in 2013, Fleetwood Macchiato has kept its charm and friendly service while updating the menu in a way that only they could. They have expanded the amount of baked goods that they supply as well. One only has to take a single step inside before the temptation of the cakes and pastries strikes! How could you say “no” to a pear, banana and caramel muffin? There always seem to be more than enough waitstaff to go around and the tables turn over quickly so there isn’t normally a wait. Fresh juice is available in one form or another each week and FM has kept one of my favourite combinations of theirs: orange, mango and raspberry. Orange or watermelon and mint is also available. 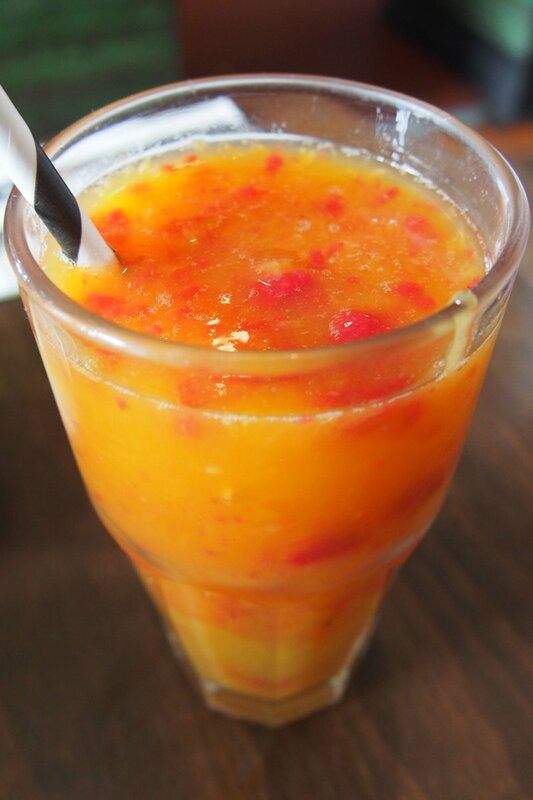 There’s enough mango and raspberry to set this drink apart rather than make them mere afterthoughts to the orange. Not overly sweet and incredibly refreshing. The housemade sodas are still a staple and they are currently offered as lime, lemonade, cola, ginger & rhubarb shrub or verbena & blackberry shrub. I hadn’t tried Sample Roasters coffee before but I’m definitely going to keep an eye out for it in the future as its depth and robustness was outstanding. FM uses the pacemaker blend in white coffees ($3.50) and a variety of others are available in their black or iced versions. 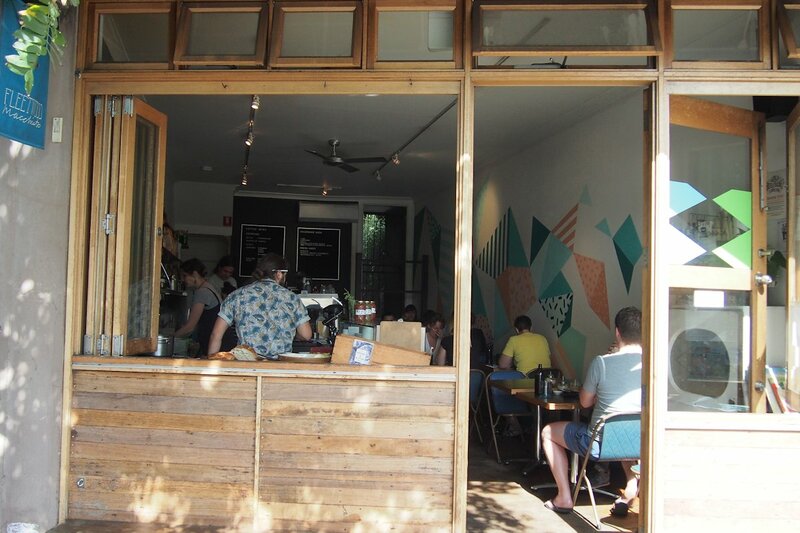 If you’re after a café that knows its coffee, FM has your number. The potato and mushroom galette ($19) was actually the smallest item on this plate. 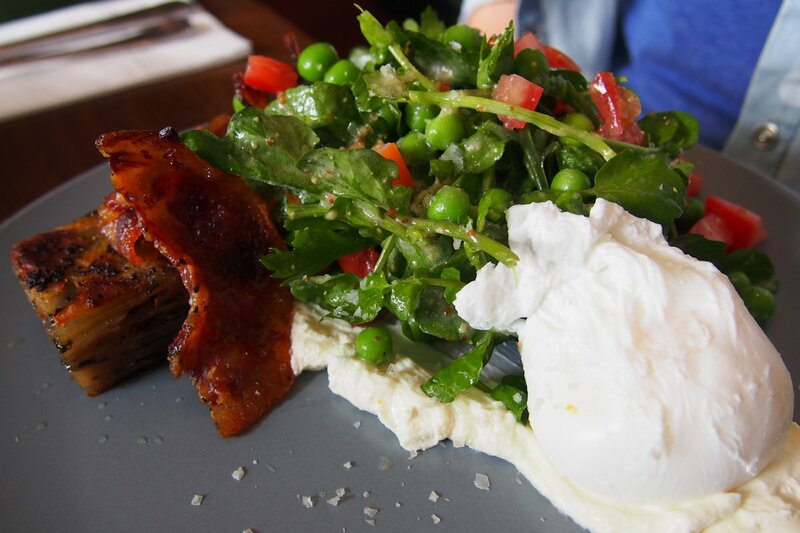 It was served with labne, cooked guanciale (an Italian salami), a poached egg and a salad with peas, tomato and a tangy, creamy dressing. 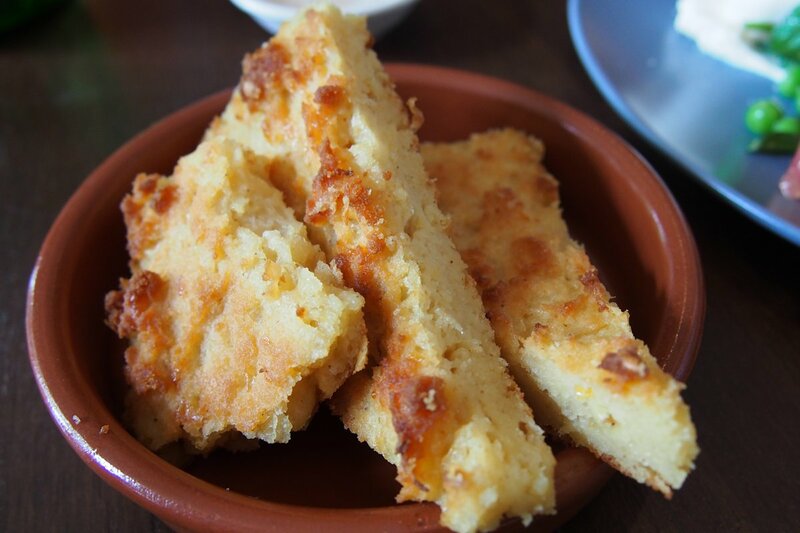 On the side, my guest ordered some house-made corn bread ($5) which I enjoyed because of it’s moistness and strong corn flavour however she found it overpowering. The salad and its strong yet harmonious dressing that brought the other ingredients together was one of the best flavours on the plate. The galette itself was crispy on top with thin, fall-apart potato slivers and small pockets of mushroom. The seasoning was sufficient but I found the galette to be overly oily which took over the subtle flavours. 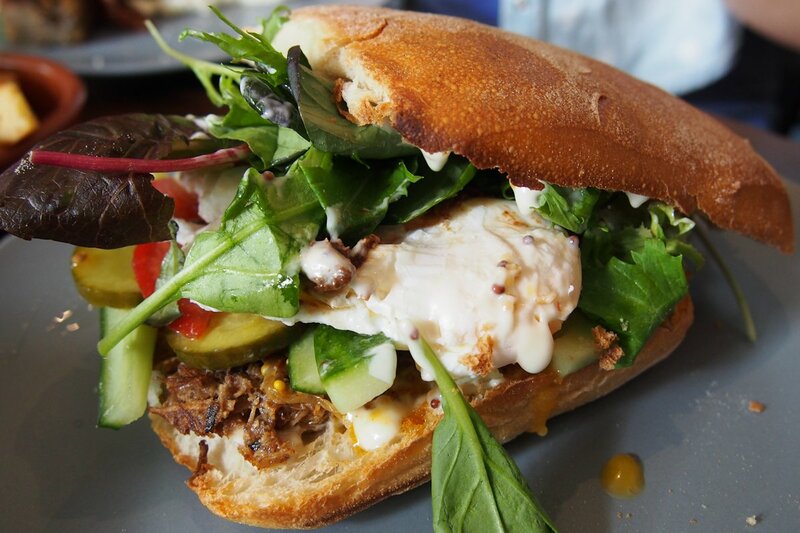 The smashed egg breakfast roll ($14 or with ham morciall, chorizo or braised pork $16.50) is served on very soft and flavoursome rolls from The Bread & Butter Project and shows a definite command of flavours. I opted for the braised pork addition and boy does it work well with everything but particularly the pickles and smoked chilli. Also thrown into the mix are two eggs, tomato, mayonnaise and mesclun. Nothing overpowers here, it was just bliss. Other dishes currently on the menu work trying include plum, pear and toasted nuts & seeds, house-made yoghurt and lemon balm ($15), beetroot cured ocean trout, fennel, watercress, olive, soft boiled egg and toast ($22) and roasted cauliflower, house made corn bread, pickled broccoli, jalapeno, poached eggs and parmesan ($18). There aren’t many cafés that you could visit where there exists such a unique menu with items that harmonise with one another so well. What’s more, you’re always in for a laid-back, well executed meal with exquisitely sought ingredients.